No one disputes that smoking is the major cause of chronic obstructive pulmonary disease (COPD), the difficulty breathing that strikes so many Americans in their twilight years. A new study by Duke University and CPWR researchers, however, reminds us that smoking is far from the only cause, and we still have a lot of work to do if we are going to protect construction workers. Investigators compared the work histories of 834 construction workers with COPD to 1243 controls who did not. Workplace exposures to an unhealthy combination of vapors, gases, dusts and fumes (VGDF) accounted for nearly one in five COPD cases. Many workers with COPD had never smoked a day in their lives; one-third of these cases were attributable to workplace exposure. A simplistic view of COPD in the workforce might lead employers to begin and end with smoking cessation efforts, but the evidence says otherwise. In construction, at least, occupational exposures remain a major cause of COPD in their own right, and we need to protect workers by getting VGDF under control. 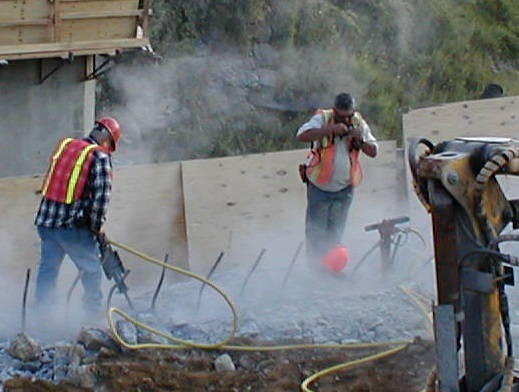 A summary of A case-control study of airways obstruction among construction workers is available from CPWR; the complete report appears in the American Journal of Industrial Medicine. A case-control study of airways obstruction among construction workers. John Dement, Laura Welch, Knut Ringen, Patricia Quinn, Anna Chen and Scott Haas. American Journal of Industrial Medicine, published online ahead of print. Introduction to the collection on research to practice in the construction industry. Laura Welch and Robin Baker. Preventing falls in residential construction: Effectiveness of engaging partners for a national social marketing campaign. Everly Macario, Sandra Wills Hannon, Robin Baker, Christine M. Branche and Christina Trahan. Moving research to practice through partnership: A case study in Asphalt Paving. Charlotte Chang, Laura Nixon and Robin Baker. Promoting adoption of fall prevention measures among Latino workers and residential contractors: Formative research findings. Suzanne Teran, Hillary Blecker, Kelsie Scruggs, Javier García Hernández and Barbara Rahke. Creating a climate for ergonomic changes in the construction industry. Laura Boatman, Debra Chaplan, Suzanne Teran and Laura S. Welch. Best practices for health and safety technology transfer in construction. Laura Welch, Dustin Russell, Deborah Weinstock, and Eileen Betit. Triage for action: Systematic assessment and dissemination of construction health and safety research.Robin Baker, Charlotte Chang, Jessica Bunting and Eileen Betit. CPWR -- The Center for Construction Research and Training is a 501(c)(3) non-profit organization created by North America's Building Trades Unions, AFL-CIO. Working with partners like you in business, labor, government, and the universities, we strive every day to make work safer for the 9 million men and women who work in the U.S. construction industry!